If you are running Windows 7, 8, or 8.1 the picture above should be a very familiar sight. 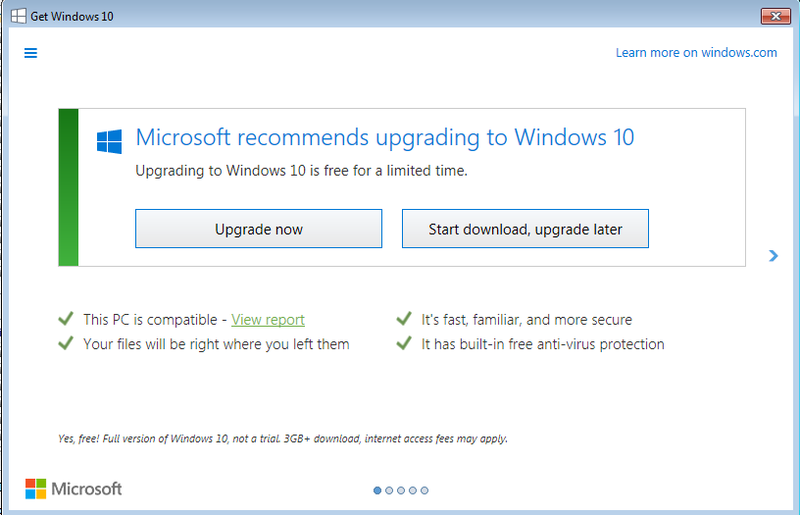 Microsoft REALLY, REALLY, REALLY wants you to upgrade to Windows 10 for free. We get calls daily at the shop asking us our opinion about whether to upgrade or not. Windows 10 is actually a good Operating System, as it blends the best of Windows 7, 8, and 8.1 plus it offers some really cool new features such as the integrated Cortana digital assistant, a revamped Start Menu, the Edge Web Browser, the ability to run Multiple Desktops, and more. 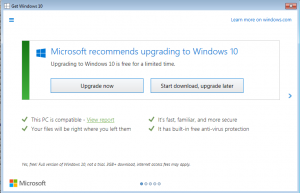 But the purpose of this article is not to review the new features of Windows 10, but rather to answer the upgrade question. To cut to the quick, our answer is a resounding NO. The overwhelming majority of issues we see regarding Windows 10 computers that are brought to our shop are systems that have been upgraded from a previous version of Windows. When Windows 10 comes pre-installed from the factory as the default Operating System, there are very few problems. The computer is fast and stable, and most of the issues are either end user caused, or due to software incompatibility. Computers today have a lifespan of about 3-4 years. If you have an older version of Windows, odds are your system is nearing or past that mark. Continue to use the system as long as it is running and Microsoft is supporting it (Windows 8 has already been retired), but don’t think you can breathe new life in to it by upgrading your old hardware to Windows 10. If you really want to try Windows 10 our best recommendation is to buy a new computer with it already installed. If you do try to upgrade your current system to Windows 10, make sure you have an image based backup in case you want to revert back to the way your computer was before the upgrade. noun 1. Alpha: from the first letter of the Greek alphabet; being the most prominent, talented. 2. Geek: a computer expert or enthusiant. career 1. The head geek; a Geek's geek. The one you call on when you need computer support, maintenance, and repair MUST be done right.